Tabitha Holland works under the name Think Cowboy Designs and can take care of all of your marketing needs. If you need photos for a stallion ad, a website or even a design for your stall curtains, she will deliver a creative solution for you. Tabitha also does custom artwork including equine portraits, painted clothing and show clothing design. Click on the links below to see samples of projects completed by Think Cowboy Designs. 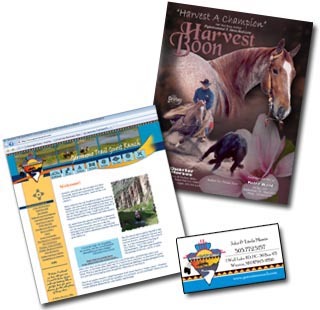 Think Cowboy Designs offers competitive pricing and quick turn around. We are not limited to the equine industry, we can help any business present a professional unique image. Contact us today to discuss your marketing needs and to receive a quote for our services.